Holly participated (along with 4 other organizations) in planning the Los Olivos Quickdraw event from 2010-2011. This one day event brings around 500+ people to Los Olivos to enjoy watching artists create an original work of art in 1-hour, and have the opportunity to purchase the piece of their choice through a live auction. 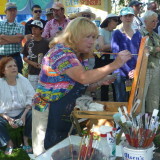 In addition, galleries offer special demonstrations and their is a silent auction of more artwork. 2010 Project involved: Planning meetings, selecting artists, and creation of artist agreement forms. Marketing, website, brochures, and oversight of the event. 2011 Project involved: Planning meetings, selecting artists, marketing, web content, brochures, and oversight of the event.